People from across Hartlepool and further afield have shown their support for a petition calling for an inquiry into the shooting of a dog following a protest in the town. 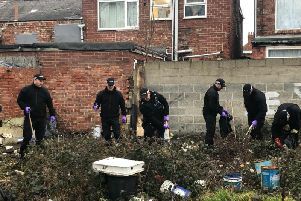 Scores of supporters of the Justice for Angel campaign turned out in Mainsforth Terrace, Hartlepool, on Sunday - close to the spot where the dog was shot dead by Cleveland Police on Sunday, January 21. Jenna Davies, centre, with fellow members of the Justice for Angel group during the event held at Mainsforth Terrace. The Caucasian shepherd was destroyed by officers after she was left tied to a pole, with the force defending its decision, saying it was taken following discussions with a number of veterinary professions, the RSPCA and a rehoming charity. Officers defended the action, saying the animal, named Angel by protestors, had become extremely aggressive and unapproachable. Campaigners have set up a series of petitions and fundraising accounts as the call for a probe to be held into what happened in the hope the situation will not be repeated. The latest petition called Justice for Angel, asks for support to explore the reason behind the decision, make those involved accountable for their actions and help make sure it never happens again. The dog in Mainsforth Terrace before it was shot by police. More than 1,539 people have signed it so far. A petition initially set up shortly after the death of the dog, collected more than 201,000 names, calling for the Independent Police Complaints Commission to take action and sent to the Government. Following the protest at then weekend people have commented on the Mail’s story on Facebook offering support for the campaign. Michaela Stephens said: “The Justice for Angel cause has many supporters who don’t live in the town, so couldn’t attend the vigil. “She could have been anyone’s beloved pet. “It is shameful that this happened in the town. But some disagreed, Ann Johnson said: “I am angry that the owner had put my community in potential danger.